American photojournalist Al Rockoff took the stand at the Khmer Rouge Tribunal this week and gave a graphic eyewitness account of the forced evacuation of Phnom Penh in April 1975, shortly after Pol Pot and the ultra-Maoists seized control of the capital. Hell-bent on turning Cambodia into an agrarian utopia, Pol Pot ordered the people of Phnom Penh out of the city almost immediately. In his description of the event, Rockoff’s insight into the Communist mentality was as unique as it was telling. That was when the order came to evacuate. Rockoff, 64, spoke of thousands of people desperate for refuge, how a giant pool in a five-star hotel was turned into a septic tank, which he described as “gross”, and how patients were marched out of hospital wards, leaving behind them bloodied floors. Throughout the ordeal, former Cambodian head of state and senior Khmer Rouge cadre Khieu Samphan listened intently, clasping his hands and taking notes. Of the other two currently before the court, former Khmer Rouge official Ieng Sary watched the proceedings from a cell below the court, while former chief Khmer Rouge ideologist and communist politician Nuon Chea waived his right to attend after being hospitalized for an illness. 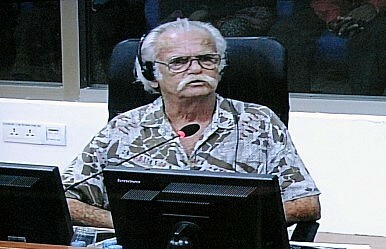 A former U.S. Army photographer, Rockoff is the first U.S. military veteran who served in Indochina during what he refers to as the “American War” to testify before the court. The tribunal’s mandate is to hear crimes and weigh evidence regarding events that occurred only between April 17, 1975, and January 9, 1979, when the Khmer Rouge were ousted by a Vietnamese offensive. After scouting the city on an assignment, Rockoff and The New York Times journalist Sydney Schanberg encountered Khmer Rouge soldiers, some quite young, and were forced into an armored personnel carrier (APC) where they tried to pass themselves off as French. “Sydney got very upset when I started speaking English in the APC, and he said, ‘Don’t speak English. You’re French,’” Rockoff said. Their bags were then searched. Pol Pot abolished money as more than two million people were ordered out of the city. Just as many would die through starvation, illness and in the extermination camps he constructed. Rockoff and Schanberg, along with the British journalist Jon Swain and Cambodian photojournalist Dith Pran, remained in Phnom Penh after the city fell to the communists. Their exploits were made famous by the Oscar-nominated Roland Joffe film The Killing Fields. Eventually, they found refuge in the French embassy along with all other foreigners and hundreds of desperate Cambodians looking for a way out. Several weeks later they were transported overland to the Thai border. Rockoff’s retelling of these traumatic events is only the beginning of this historic trial. The hearings are ongoing and more will surely come to light. Cambodia: When Clouds FellKhmer Rouge Tribunal: The Devil’s AdvocatesChilling Evidence in Khmer Rouge Trial Duch Appeal NixedKhmer Rouge: It was Vietnam!